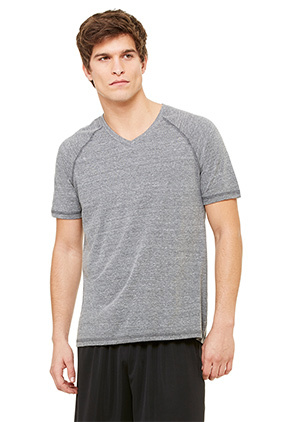 This super soft men's v-neck is engineered with extreme performance capabilities, but feels like a cotton tee. 50% polyester/37.5% Airlume combed and ring-spun cotton/12.5% rayon triblend v-neck t-shirt. Tonal stitch that is one shade darker than body color (Black body features a tonal stitch that is one shade lighter than body color. White body features a grey tonal stitch). Tear away label. Dry wicking. Antimicrobial.